Tony is a TV and radio comedian and best-selling author. He is the author of the bestseller Round Ireland with a Fridge – the story of his absurd quest to hitch round the circumference of Ireland within a month…with a fridge. After being serialised on Radio 4, the book became a top 10 Sunday Times bestseller. It has now sold over 800,000 copies worldwide including the US and Australia, and has been translated into several languages; Hebrew, Italian, Dutch and German. The book is now a feature film, and winner of the Paris Boulogne Billancourt Film Festival audience award. More details at www.roundirelandwithafridge.com. Tony has written four other books, including Playing the Moldovans at Tennis (also serialised on BBC R4 and shortlisted for both the Samuel Johnson Prize (2000) for non-fiction writing and the Bollinger Everyman Wodehouse Prize (2000), and also released as a feature film in the summer of 2012. Tony is the founder of the Tony Hawks Centre, Chisinau – a medical centre for children with cerebral palsy. Other books include One Hit Wonderland, A Piano in the Pyrenees, and The Fridgehiker’s Guide to Life. He has appeared frequently on many UK TV shows including: QI, Have I Got News For You, They Think It’s All Over, A Bit of Fry and Laurie and Red Dwarf. 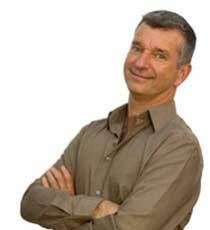 Tony Hawks is a regular guest on radio 4 programmes Just a Minute, and I’m Sorry I Haven’t a Clue. Tony is a regular after-dinner speaker at corporate events up and down the country and his warm, dry style and aptitude for ad-libbing makes him a popular choice as a host for award ceremonies. He hosted The British Book Awards (The Nibbies) for three consecutive years, as well as numerous others.